Efforts to assess the extent of the fire in Betws-y-Coed, Conwy county, are still ongoing, North Wales Fire and Rescue said. Six crews and an incident command unit were at the scene alongside the police at the height of the fire. There are no reports of injuries following the blaze that was reported at 16:15 GMT. North Wales Police said residents from at least four properties close to the fire were evacuated as a precaution. By 22:20, two crews were left at the scene. Helen Fisher, of Betws-y-Coed, said that the flames appeared to be "the height of trees", through her partner's camera. 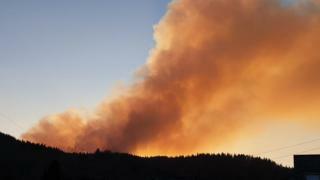 Ms Fisher noticed the fire at about 17:30 GMT and saw the smoke across the Conwy valley. "I think it is considerable," she said. "There was a grey trail of smoke all the way across the Conwy valley to the coast."